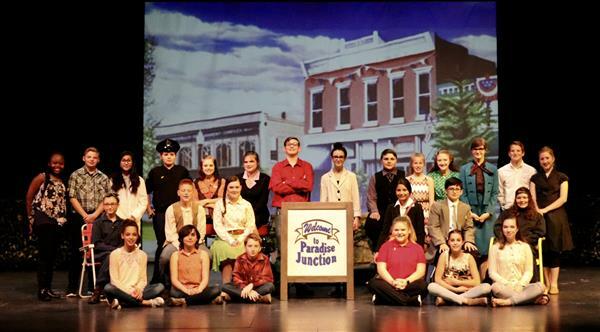 The Alma Middle School performed 'Trouble in Paradise Junction' this past weekend at the Alma Performing Arts Center. In this love letter to small-town life, Paradise Junction is the “best little town in the world,” a place where everyone gets along, the sun is always shining, and the tomatoes grow as big as beach balls. So when a TV network offers to film a reality show there, the townsfolk jump at the chance. After all, the town will receive five million dollars, while the publicity promises to turn the residents into TV stars. But host Wink Smiley has his own agenda. Secrets are revealed, old feuds are rekindled, and the town’s annual pie-baking contest is turned into a massive food fight. Now it’s up to Joe Goode, owner of the Rise ’n’ Shine Diner, to save the town. Will he find a way to stop Wink or will the residents be tricked into destroying their beloved town on live television? Inspired by the films of Frank Capra such as It’s a Wonderful Life and Mr. Smith Goes to Washington, this heartwarming comedy made the audience cheer while reminding us all what really matters in life. The show was performed by 28 middle school students and directed by Marti Salisbury. The crew consisted of students from middle school and high school.